Bay Area's Steep Housing Costs Spark Return To Communal Living : All Tech Considered Young professionals "co-living" in San Francisco-area mansions say they're doing more than cutting costs and promoting sustainability — they're building communities, and tech-powered social networking makes it easier. 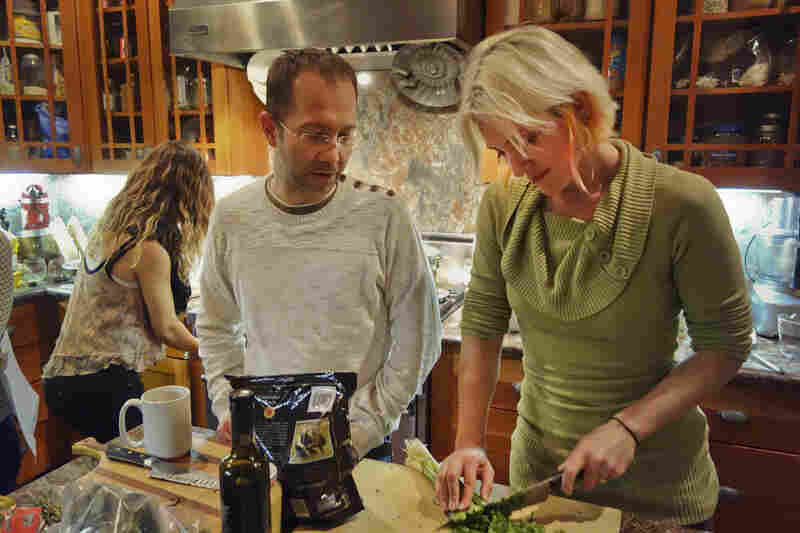 "Food is a core component of what we do, and it's a really easy way to unite people," Jessy Schingler (right) says of the co-living home she co-founded in San Francisco. The Sandbox House is a co-living home in South Berkeley. 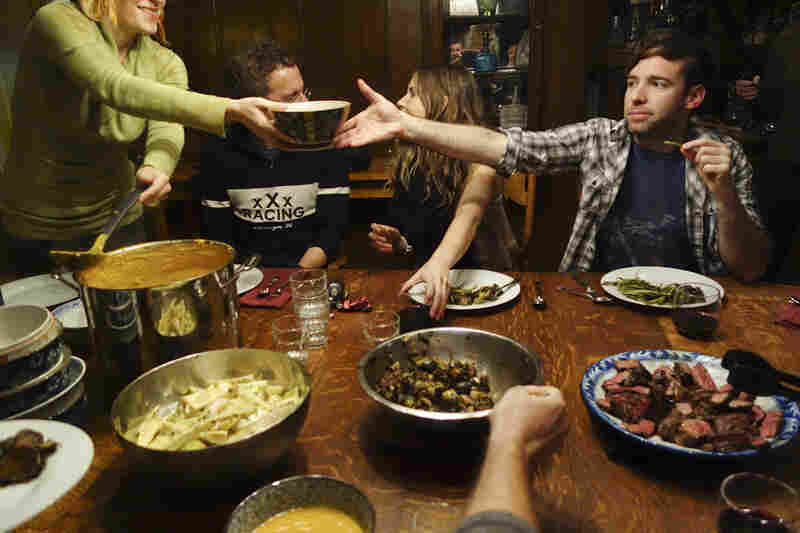 Housemates prepare a big meal and dine together every Sunday night, and sometimes more often, at San Francisco's Embassy House, a co-living home. 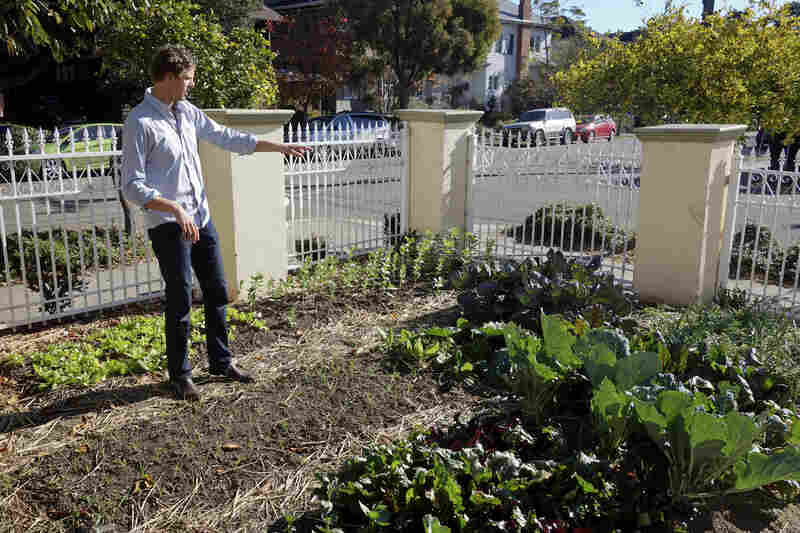 Ben Provan, co-founder of a co-living home in Berkeley, tends to a sprawling vegetable garden that grows enough food to feed the residents. 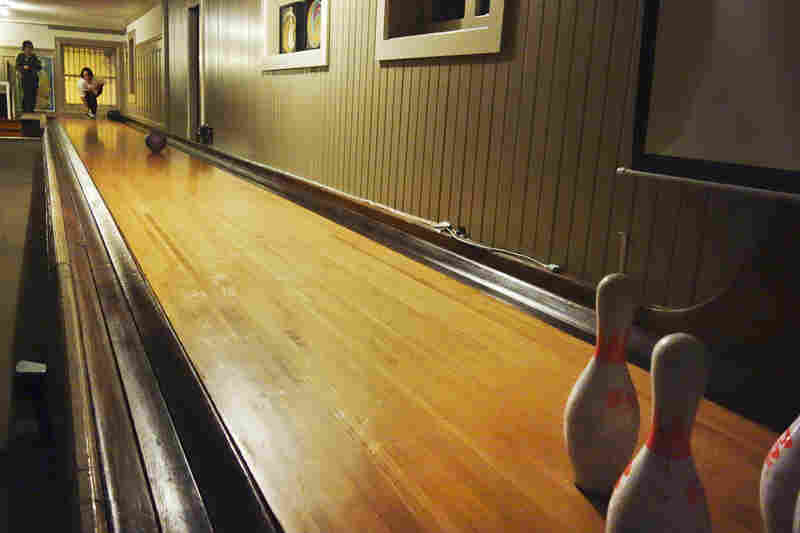 San Francisco's Embassy House has an early 1900s-style bowling alley in the basement. Housemates use software to keep up with events and one another. At this co-living home, if you cook, you don't clean, and if you clean, you don't cook. The only sacred rule is: No dishes get left in the sink. It's no secret rents have skyrocketed in the San Francisco Bay Area, fueled by tight housing stock and the latest tech boom. But some young professionals have turned the situation into an opportunity with a return to communal living, or "co-living," as it's now called. "It's absolutely a modern commune, but we prefer the term co-living," Derek Dunfield says, as he tours a 7,500-square-foot San Francisco Edwardian mansion he shares with a dozen others. "I think what it really is is an example of what the sharing economy can actually do." He lives in this space with other professionals in their late 20s and early 30s. The housemates include an architect, a tech entrepreneur and someone who works in the mayor's office. They all work during the day, but at least once a week, they come together to cook a huge meal together for one another and any guests who want to show up. They share groceries, household responsibilities and decision-making in who gets to move in, should a spot become available. "We live here, but we also host events. We have hackathons, and we have salons, and we have concerts," says Jessy Schingler, a co-founder of the house. She says co-living creates economies of scale, but, more importantly, it creates community. There's an emphasis on creating connections among people who live in the homes with big family-style dinners and amenities like huge outdoor vegetable gardens, basement bowling alleys and music rooms. And keeping the order isn't a hassle as long as everyone abides by the one sacred rule: no dishes get left in the sink. With Home Prices Soaring, Has Success Spoiled San Francisco? 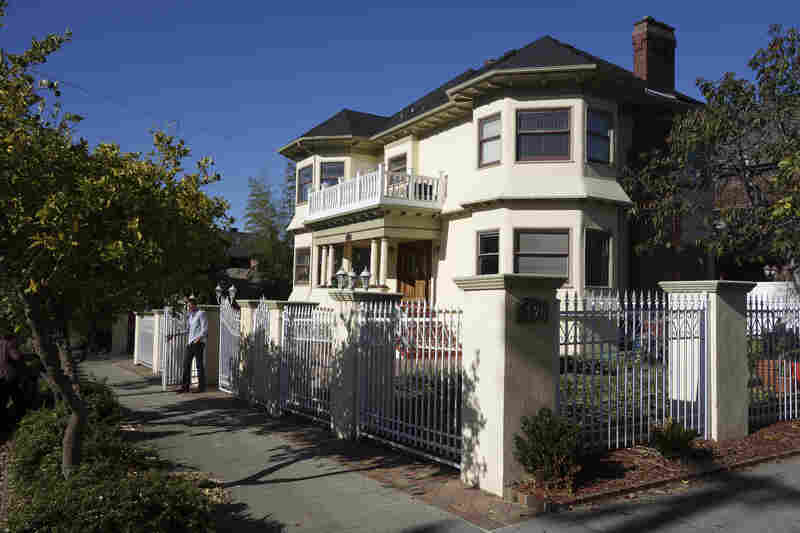 The San Francisco Chronicle reports that about a dozen mansions in the Bay Area are currently leased to groups of young entrepreneurs and run as communal living spaces. Schingler puts the total co-living count even higher, saying there are about 50 of these big group living arrangements in and around the Bay Area, in which 10 or more unrelated folks move in together in grand estates. It makes economic sense. Census numbers show San Franciscans pay the highest rent in the country. Median rent for a two-bedroom apartment there is $3,200 per month, but if you snag a spot in a co-living house, you can pay about half that. "San Francisco is way too hot right now," says David Sobel, the chief executive officer of the San Francisco Housing Development Corp., a nonprofit that advocates for affordable housing options in the city. "You need to be a millionaire really to buy a home at the median home price nowadays. That does not bode well for an overall diverse and healthy city, which is one of the great traditions of San Francisco." Sobel says the rise of communal living cuts two ways. He likes that young professionals have found ways to make city-dwelling possible, because cities need income diversity, and young people shouldn't be forced to commute hours to get to work. But when mansions get scooped up quickly, it does have an impact on the market. "Individuals and families who are looking to purchase or rent those same resources are going to have more competition to do so. So ultimately I think there needs to be a balance between those two forces," Sobel says. Plenty of the co-living folks feel the same way. That's why they're expanding to other parts of the Bay Area, like Berkeley — just east of San Francisco. There, two business school grads — Jay Standish and Ben Provan — head up a smaller co-living house. While all of this does cut costs and promotes sustainability (they grow their own food and share cars), the co-founders say co-living is more than just random roommates coming together. They are trying to build communities of passionate young people where they didn't exist before. And that's made easier thanks to tech-powered social networking. "In some ways, this is the millennial generation's take on how to live together. Maybe we say social networking, but that's actually just community or a tribe or a village," Standish says. Technology brought them together, but they realize this kind of lifestyle dates to the beginning of civilization. "It's definitely a case of going back to the future," Provan says. Now, the founders of the San Francisco house and this Berkeley home have organized themselves into a startup real estate business. Their 3-month-old company, Open Door Development Group, is now enticing investors to help it buy a few big homes for co-living. They were once strangers. Online networks made them friends, and living together makes them more like family. After dinner, in keeping with the one rule of giant co-living houses, someone will do all of the dishes.